When I was a silly, young vegetarian, I declared french fries my favorite food. From the mall food court, to unmentionable chains, and even diners, it was true! I later learned that french fries shouldn’t be a food group, but the adoration is still there. Portland has a lot of contenders for best french fry purveyor – from the classic fries at Dots with their spicy tofu sauce, seasoned fries at Bonfire, garlic at Goodfoot, super crispy at Hungry Tiger Too, rustic at Pause, and classics at Burgerville, you can get your greasy, salty fix in any neighborhood until the early morning. Portland’s newest french fry fix, the Potato Champion cart, is now open for business and definitely in the running for best fried potato sticks. The cart is located in the corner in the food cart dominated park lot at SE 12th and SE Hawthorne Street. It’s brightly painted with a blue sky and green rolling hills and the smell of fries drifts from blocks away, bringing you closer and closer. Options consist of fries, soda, dips, and gravy for the fries. The fries are Belgian frites style, having been cooked twice in oil. They are handed down from the cart’s window, with basic condiments like ketchup, mustard, and salt available on an outer ledge. The fries are sold straight up as small ($3.50) and large cones ($4.50). Getting to the point, the fries are reliably crispy, hot, and fairly salty. They don’t taste like bland, old potatoes – they taste like golden strips of potato. They’re greasier than you might expect, because they’re quickly fried upon your order and then abruptly drained of oil. Fresh out of a fryer is either going to strike you as appetizing or appalling; you either dig fried potatoes, or you don’t. The downside to the cone was experienced on a of couple visits: the very, very bottom fries were all what could be called stragglers: 1/2 inch of less pieces of overcooked potato, but the rest were perfect! The cone is somewhat easy to walk around with if you’re comfortable with either dumping condiments on top or going bare. If you’re lucky, the cart’s picnic table or tree stump-style seating circle will be available for easy going munching and dipping. Each order of fries comes with one sauce of choice, and additional sauce is available for 50 cents a piece. The vegan choices include horseradish ketchup, Vegenaise, djion mustard, and a surprisingly mild rosemary truffle ketchup. My dining partner and I were ready to be negatively overwhelmed by the rosemary truffle-ness, but we really liked it. The two of us barely made 1/4 of a dent in the dip as well, opting for regular ketchup every so often. A vegan peanut satay sauce is in the works, and regular ketchup and mustard are totally free. Small and large cups of vegan Poutine ($4.00 and $5.00) are made up of fries, vegan gravy, and chunks of Follow Your Heart cheddar. The gravy is housemade with a thin base of vegetable stock, balsamic vinegar, and onions. It’s tangier than something you’d put on your vegan biscuits, and even more pungent when you bite into the cheeze. The salty fries do get soggy, as is the tradition with gravy fries, but the meal does come with a fork. Share with a friend to keep the fries going into your mouth somewhat crispy. Half of a small vegan Poutine was more than enough for me, and the flavor combinations were nothing I’d crave in the future, but big points for creativity and thoughtfulness. I’d like to hear what others think of it! It’s not like you’re going to visit the cart with a side salad in hand! After his first few bites of Belgian fries, my dining companion instructed me to hit him over the head with a baseball bat if he ever contemplated baking fries in an oven again. Living within walking distance, he simply needs to hold out and eat healthy through Sunday-Tuesday! i haven’t had it yet but i definitely want to try buying Food Fight’s pump cheese and eating the fries with it. last time i heard, the fry dude was trying to get his own pump! The Poutine looks so good! Did you know this is the UN Year of the Potato? check out http://www.potato2008.org/ for more info. These are the best fries I’ve ever had. I try to avoid fried food, but these were good enough that there was no way to regret eating them. And the guy who runs the cart is terrifically friendly. I wasn’t a big fan of the poutine. I think it was the onions. And the fact that I don’t really like vegan cheese. HOLY CRAP! Are you serious? Poutine!? VEGAN POUTINE!!! OH MY F’n GOODNESS! French Canadian goodness and vegan too. I think Portland just beat Montreal to the max. I shared my Poutine with my boyfriend and he said “Baby this is the best Poutine I ever ate!” No seriously it was really good and he ate most of it! This was also the large order. The bits left behind were awesome. The guy working the cart was really nice, helpful and was not bad to look at. Now us Vegans that do drink have a place to buy some delicious, greasy fried goodness late at night. Ohmigawd! 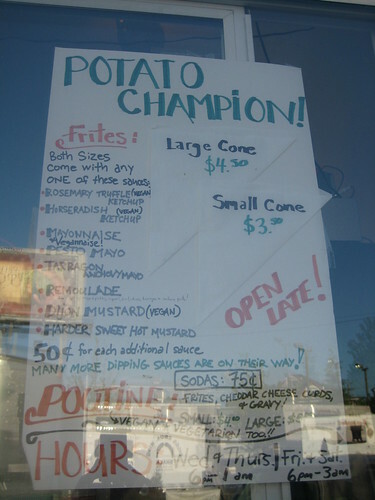 I just got back from Potato Champion with my vegan poutine after reading about it here, and it is amazing. It is really bad that they are a scant three blocks from my house. I am now on a mission to share the wonder with everyone I know. I got told about this cart of delish from a friend of mine who just raved about it. I thought it’d be just some junky ghetto greasy run of the mill fries that I would be too yucked out to try (I am a seriously picky eater) but upon getting there and trying the large cone of fries I am a convert and would want to share the gospel of this place with everyone only then I would worry they would run out of fries for me. The dude who ran the place was super nice, the fries are truly out of this world (best I ever had, EVER). I crave them all the time now. Next time I’m in Portland I look forward to those fries. Best fries on the West Coast. I love french fries! The fries at this place are off the hook! I havent found any better in Portland! YOU DONT WANT TO MISS THIS PLACE!! Did I mention I love fries? Looks like this spot is on my list. I have eaten at this place twice, and the fries are o.k, but what I got each time was maybe ten of fries that were longer than an inch and the balance were these little nuggets you cant even dip there so small.